After reading this post this morning on Robb Wolf’s blog, I got pretty inspired. 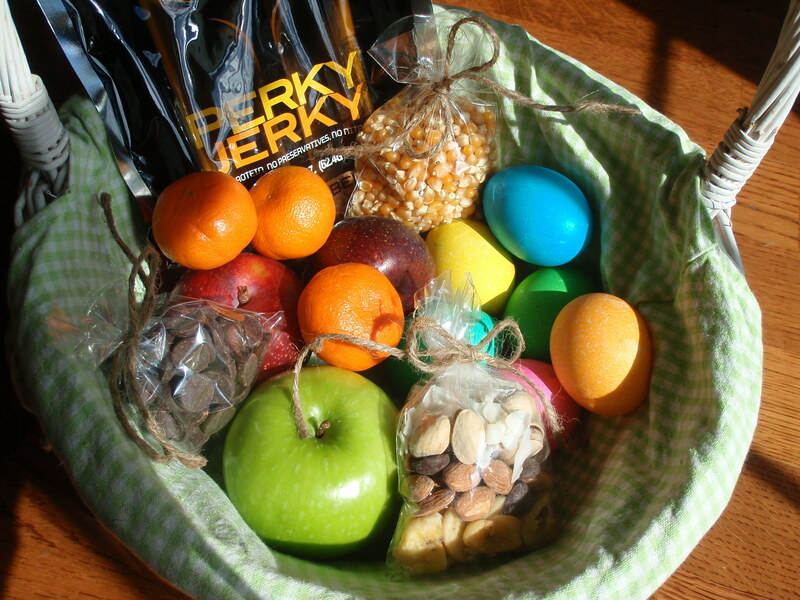 I went through my pantry, and decided to see what I could come up with to make up a healthy Easter basket on the spot. If only I had a little time, I would have included my Laraballs and some “paleo” cookies or muffins. I can tell you right now, my kids would really enjoy having access to their very own private stash of those treats!! I was really surprised to see how colorful and enticing this basket turned out…and as you can see my 6-year-old got pretty excited about it too! 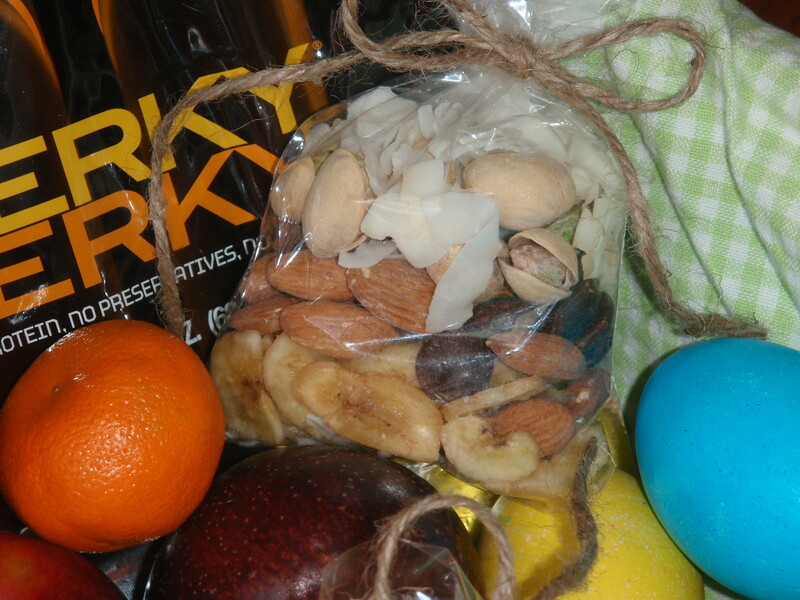 Don’t feel pressure to stay with the same-old predictable Easter basket. 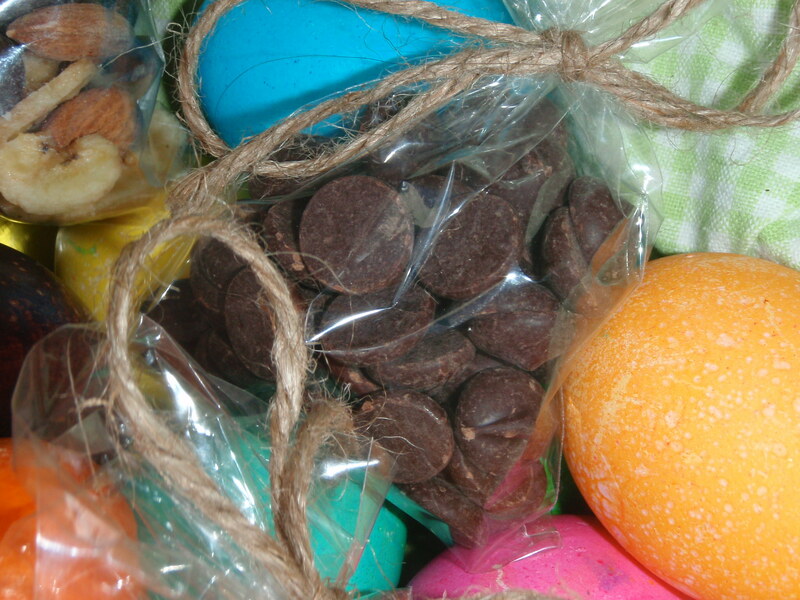 If you have a favorite candy that just makes Easter Easter for you, then by all means include it…it’s a holiday! But also remember that it’s your privilege to make new traditions for your family. Holidays were a big thing in my family growing up. My amazing mom outdid herself on every holiday–big or small. I definitely followed in her footsteps and tend to go nuts for all special events. 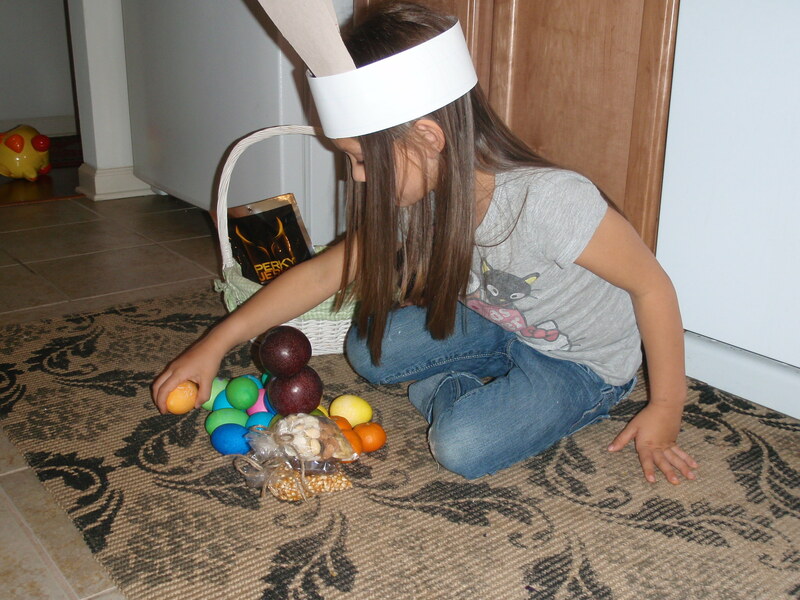 Here are a few fun ways to ring in Easter and Spring while sparing the kids from a couple of the Easter basket treat induced sugar roller coaster rides! 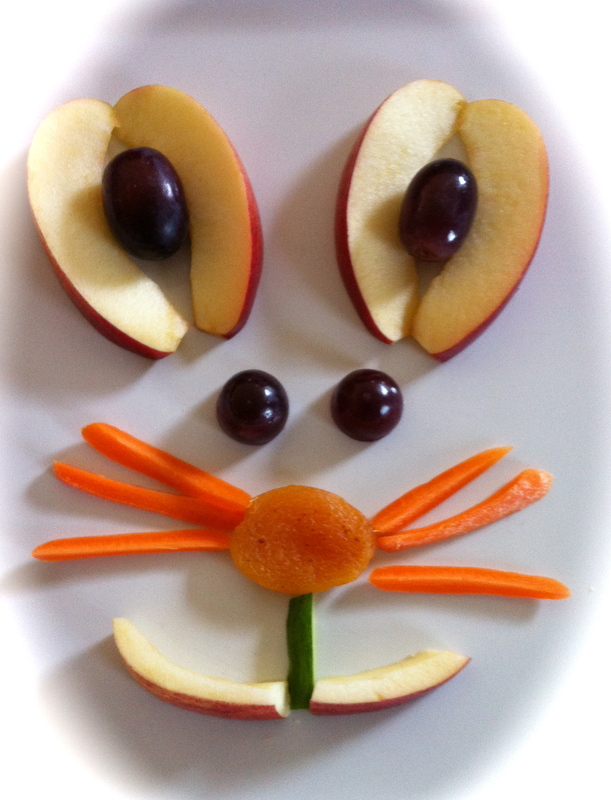 Great for an after school or post egg hunt snack! I used apples, strawberries, blueberries, cheese cut in circles, carrots, cucumber, and mini almonds but feel free to get creative with what you have on hand! 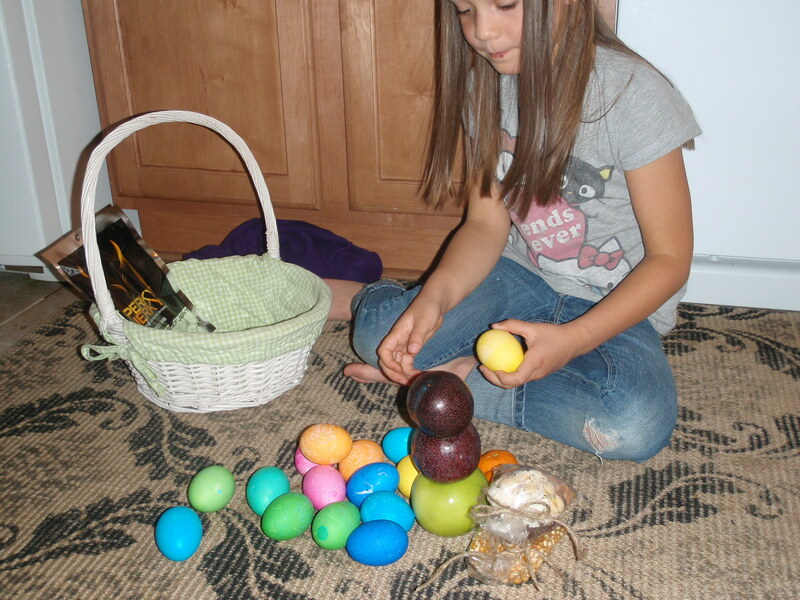 You can even pre-cut everything and have your kids put together their own bunny! Nut and dairy free version using apples, grapes, carrots, dried apricots, and cucumber! Found these cuties in Family Fun magazine. My kids LOVED creating them today. 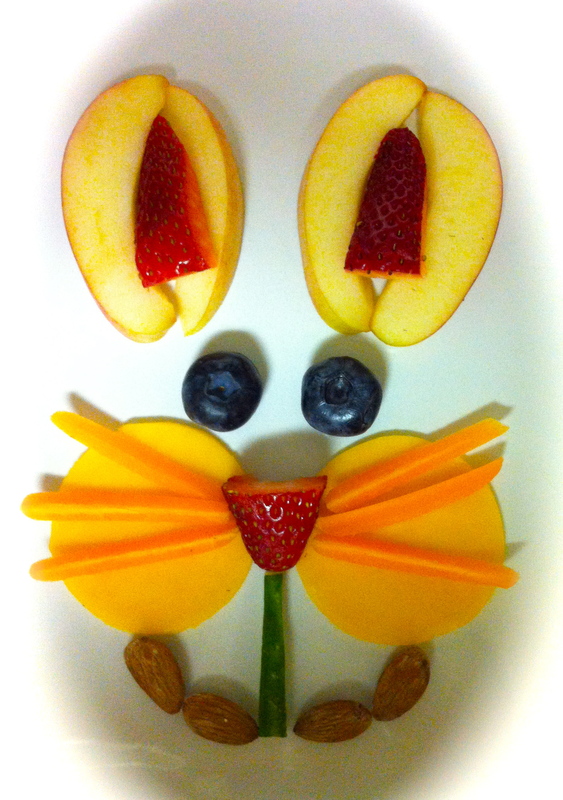 Pair with the fruit bunny above and you’ve got a full breakfast or serve alone as a post egg hunt snack! I used hard-boiled eggs, red pepper, dried papaya, carrots, broccoli, and peppercorns. 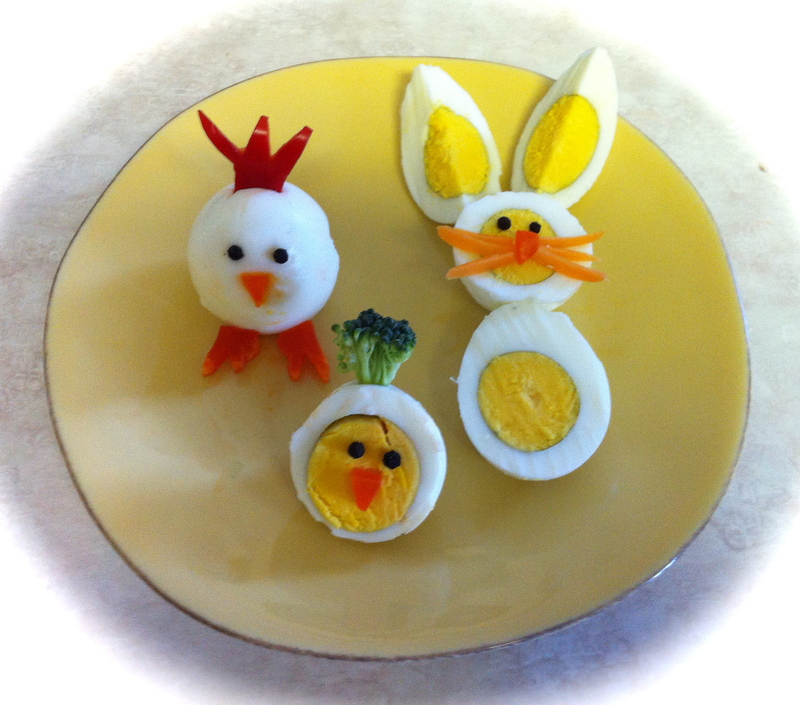 This really is a low-mental energy craft/snack that the kids will enjoy and remember every year.